Hosting interns is part of our effort to provide meaningful learning opportunities for youth, and to make the cycling community more diverse and welcoming. This Summer the Community Cycling Center hosted eight wonderful interns from three different programs! Our largest contingent of five interns came from the SummerWorks program, which aims to place diverse youth between the ages of 16 – 24 in paid summer internships. We also had two K-CHING interns through the New Columbia housing development. For the first time, we were also able to welcome an intern from the Confederated Tribes of Siletz! All of our interns did a tremendous job and were able to gain valuable real-world work experience. Two of the SummerWorks Interns worked at our bike shop on Alberta. As the ‘Donation Intake Specialist,’ Nathan learned how to process used parts and what it was like to work in a full-service bike shop. As our ‘Mechanic’s Apprentice,’ Cornelius was able to hone the skills he previously learned in our “Bike Mechanics as STEM Education” program at his school, as well as gain new knowledge by working in a full-service bike shop! Not to be outdone, our office staff also hosted a Development Intern! Alexz assisted our Development Team with donor relations, in-kind donations, and event planning. She played an integral role in our Transportation Trivia event by soliciting in-kind donations. Alexz was able to gain valuable experience working in a non-profit and with Salesforce, our contact management system. 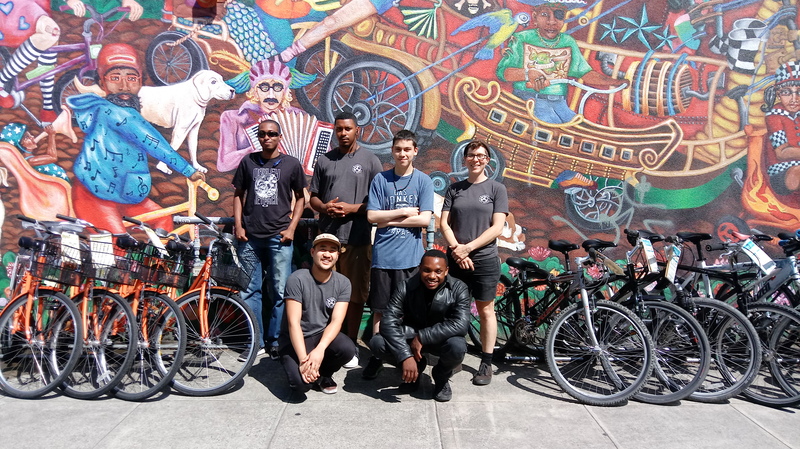 We hosted a total of five interns at our North Portland Repair Hub, where community members can learn and receive free bike repairs two days a week during the summer. Donyell, a returning SummerWorks intern, served as our Lead Intern at the Hub. Coleman, a first-time SummerWorks intern, was able to learn mechanical and customer service skills. Our two K-CHING interns, Seth and Freddy, were middle school students who were able to assist and serve as role models for younger community members frequenting the Hub. We were also able to host our first Intern from the Confederated Tribes of Siletz! Harry was able to spend time at the Hub learning how to repair bikes and customer service. Happily, all of our Hub interns were from the very community that the Hub served! This year’s interns all made valuable contributions to our organization and the community at large! We look forward to the great work that they all will do with skills they learned this Summer!